Warehouses where you need them. Does your company have the agility to respond quickly to issues that impact inventory and distribution? As an end-to-end logistics solutions provider, Transportation Insight offers short- and long-term warehousing to help companies face challenges with growth into new markets, pool consolidation and seasonal inventory issues. We feature a vast network of warehouse locations and a full suite of services for domestic order fulfillment and globally-based freight consolidation/de-consolidation. All warehousing services work seamlessly with our complete menu of domestic and international transportation services for a total supply chain solution under one umbrella. 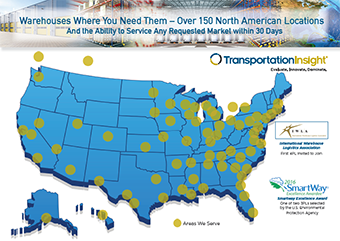 Transportation Insight offers a network of over 150 warehouse locations across North America and has the ability to grow into any needed market within 30 days. Whether your distribution network is in a state of transition or your company is seeking to lower administrative costs, our innovative warehousing services can help improve customer satisfaction and your bottom line. Noted for geographic market leadership, our warehouse services offer a complete array of capabilities as well a focus on customer care and quality. Transportation Insight also provides a web-based Warehouse Management System (WMS) with inventory visibility and control — just as if the product were shipped from your own facility. Our WMS is fully EDI capable. Inventory reporting is also available, giving you complete visibility to inbound receipts, on-hand inventory updates and links to carriers and real-time shipment tracing. 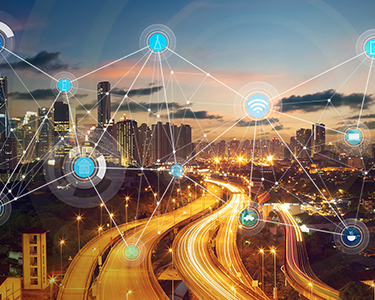 Our WMS system also links to Transportation Insight’s industry-leading TMS platform. Are you considering expanding your business into new geographic areas? How will that impact customer service and the corporate balance sheet? Companies growing into new markets typically find it involves many fixed costs, especially in the area of inventory placement. 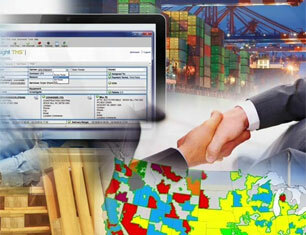 Transportation Insight offers something different with its network of over 150 warehouse locations across North America. You only pay for the space you use as you use it. 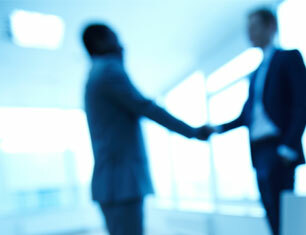 There are no long-term commitments and no residual cost if you later decide to leave the market. Since our warehouse network aligns with our domestic and international service platforms, Transportation Insight helps position your just-in-time inventory at optimal points to end markets and major customers. 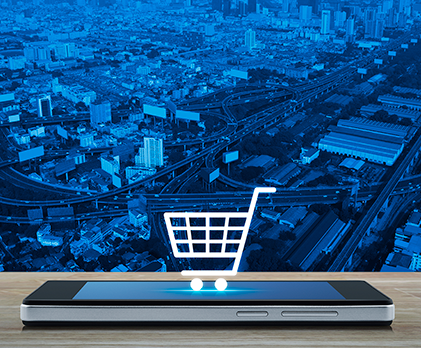 Transportation Insight has the ability to grow into any needed market within 30 days. One of the biggest challenges shippers have is the ability to respond quickly and confidently to expansions, contractions and seasonal inventory variability that impact warehousing. Our LEAN-based warehousing solutions allow you to secure additional short-term space in new markets at a reasonable rate. Access to inventory volume and activity is available through our cloud-based WMS system even on seasonal overflow projects. 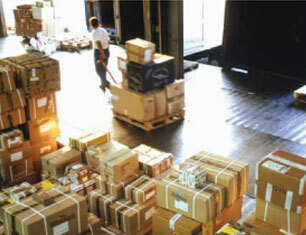 We also help you solve difficult needs with warehousing bulky, non-conveyable products. Are your warehouses in the right locations? Do you need to consolidate distribution centers? Many leading companies are turning to the logistics engineering experts at Transportation Insight to optimize warehousing locations, costs and service. All recommendations for supply chain improvement are based on careful engineering and economic analysis. We work for you and with you to develop project plans, road maps and key elements for successful change and implementation. Along with Transportation Insight’s complete array of domestic and international transportation services, we provide unique solutions regarding import containers. Our network of providers, 16 of which operate in US port locations, are fully functional in all matters relating to import containers. Services include everything from basic sort and segregation, palletizing, stretch wrapping services, to product sub assembly, inspection, and labeling. Many regard this specialization as being limited to port cities, but our network has these capabilities in each US location. When it comes to export containers and off-shore services, each of our 16 port operations is equally capable in container consolidation services. As the global supply chain continues to become more complex, we understand that many North American companies face obstacles in growing their companies forward.